Look for her tutorial soon, and thanks to all who applied. 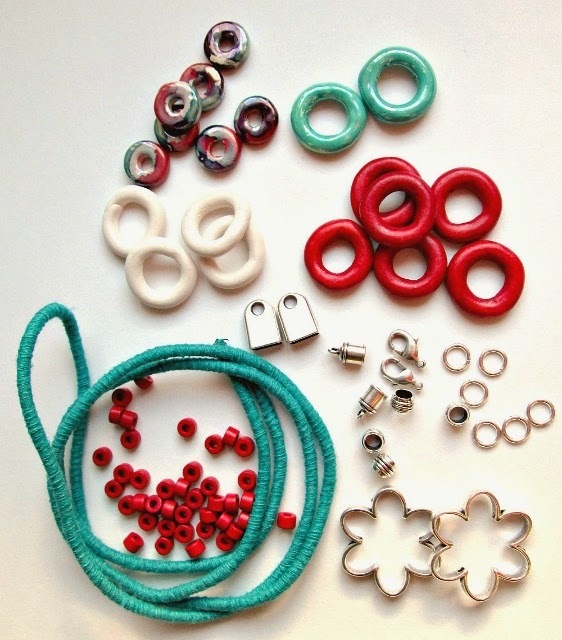 O and N Supplies is offering a collection of wrapped cotton cord combined with greek ceramic beads, silver plated beads, flower pendants and jewelry findings FREE to one Totally Tutorial reader in exchange for a tutorial using the supplies they receive. The ideal candidate will be someone comfortable working with these supplies, have a blog or website, and the ability to take nice photos. Read more about how Tutorial Exchanges work on this page. To apply for the exchange, leave a comment below with the URL to your blog or website and a way to contact you. A Totally Tutorial readers will be chosen to receive the supplies, and their resulting tutorials will be posted here on Totally Tutorials. This tutorial opportunity is open worldwide. Applications will be accepted through Wednesday, April 2. I will contact the winner of the exchange by Friday, April 4th. The lucky winner will then have until April 30th to complete their tutorial. I would like to get this opportunity, I am sharing loads of DIY ideas & my craft tutorials at blog from more than a couple years. So it would be fun working with your supplies too.. I'd love a chance! My blog is http://www.rentalrevival.com and my e-mail is rentalrevival@gmail.com. Thanks! Hello, my name is Raquel and my blog, micromacramebyraquel.blogspot.com, is about making micro macrame jewelry and tutorials, so I'm very familiar with the use of cords, knots and beads. I would love the chance to make something beautiful with those materials. I found you from the happy hour projects blog. I would like to be considered for this opportunity...looks like fun!